Glucocorticoids (GCs) are a class of corticosteroids, which are a class of steroid hormones. Glucocorticoids are corticosteroids that bind to the glucocorticoid receptor (GR), that is present in almost every vertebrate animal cell. The name glucocorticoid (glucose + cortex + steroid) is composed from its role in regulation of glucose metabolism, synthesis in the adrenal cortex, and its steroidal structure (see structure to the right). A less common synonym is glucocorticosteroid. GCs are part of the feedback mechanism in the immune system which reduces certain aspects of immune function, such as reduction of inflammation. They are therefore used in medicine to treat diseases caused by an overactive immune system, such as allergies, asthma, autoimmune diseases, and sepsis. GCs have many diverse (pleiotropic) effects, including potentially harmful side effects, and as a result are rarely sold over the counter. They also interfere with some of the abnormal mechanisms in cancer cells, so they are used in high doses to treat cancer. This includes: inhibitory effects on lymphocyte proliferation as in the treatment of lymphomas and leukemias; and the mitigation of side effects of anticancer drugs. GCs affect cells by binding to the glucocorticoid receptor (GR). The activated GR complex, in turn, up-regulates the expression of anti-inflammatory proteins in the nucleus (a process known as transactivation) and represses the expression of proinflammatory proteins in the cytosol by preventing the translocation of other transcription factors from the cytosol into the nucleus (transrepression). 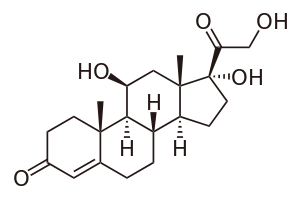 Cortisol (or hydrocortisone) is the most important human glucocorticoid. It is essential for life, and it regulates or supports a variety of important cardiovascular, metabolic, immunologic, and homeostatic functions. Various synthetic glucocorticoids are available; these are used either as replacement therapy in glucocorticoid deficiency or to suppress the immune system. Stimulation of gluconeogenesis, in particular, in the liver: This pathway results in the synthesis of glucose from nonhexose substrates, such as amino acids and glycerol from triglyceride breakdown, and is particularly important in carnivores and certain herbivores. Enhancing the expression of enzymes involved in gluconeogenesis is probably the best-known metabolic function of glucocorticoids. Glucocorticoids have multiple effects on fetal development. An important example is their role in promoting maturation of the lung and production of the surfactant necessary for extrauterine lung function. Mice with homozygous disruptions in the corticotropin-releasing hormone gene (see below) die at birth due to pulmonary immaturity. In addition, glucocorticoids are necessary for normal brain development, by initiating terminal maturation, remodeling axons and dendrites, and affecting cell survival and may also play a role in hippocampal development. Glucocorticoids act on the hippocampus, amygdala, and frontal lobes. Along with adrenaline, these enhance the formation of flashbulb memories of events associated with strong emotions, both positive and negative. This has been confirmed in studies, whereby blockade of either glucocorticoids or noradrenaline activity impaired the recall of emotionally relevant information. Additional sources have shown subjects whose fear learning was accompanied by high cortisol levels had better consolidation of this memory (this effect was more important in men). The effect that glucocorticoids have on memory may be due to damage specifically to the CA1 area of the hippocampal formation. In multiple animal studies, prolonged stress (causing prolonged increases in glucocorticoid levels) have shown destruction of the neurons in this area of the brain, which has been connected to memory performance. Glucocorticoids have also been shown to have a significant impact on vigilance (attention deficit disorder) and cognition (memory). This appears to follow the Yerkes-Dodson curve, as studies have shown circulating levels of glucocorticoids vs. memory performance follow an upside-down U pattern, much like the Yerkes-Dodson curve. For example, long-term potentiation (LTP; the process of forming long-term memories) is optimal when glucocorticoid levels are mildly elevated, whereas significant decreases of LTP are observed after adrenalectomy (low-GC state) or after exogenous glucocorticoid administration (high-GC state). Elevated levels of glucocorticoids enhance memory for emotionally arousing events, but lead more often than not to poor memory for material unrelated to the source of stress/emotional arousal. In contrast to the dose-dependent enhancing effects of glucocorticoids on memory consolidation, these stress hormones have been shown to inhibit the retrieval of already stored information. Long-term exposure to glucocorticoid medications, such as asthma and anti-inflammatory medication, has been shown to create deficits in memory and attention both during and, to a lesser extent, after treatment, a condition known as "steroid dementia." Glucocorticoids could act centrally, as well as peripherally, to assist in the normalization of extracellular fluid volume by regulating body’s action to atrial natriuretic peptide (ANP). Centrally, glucocorticoids could inhibit dehydration induced water intake; peripherally, glucocorticoids could induce a potent diuresis. Prolonged glucocorticoid treatment decreases cannabinoid CB1 receptor density in the hippocampus. Glucocorticoids bind to the cytosolic glucocorticoid receptor (GR), a type of nuclear receptor that is activated by ligand binding. After a hormone binds to the corresponding receptor, the newly formed complex translocates itself into the cell nucleus, where it binds to glucocorticoid response elements (GRE) in the promoter region of the target genes resulting in the regulation of gene expression. This process is commonly referred to as transcriptional activation, or transactivation. The opposite mechanism is called transcriptional repression, or transrepression. The classical understanding of this mechanism is that activated GR binds to DNA in the same site where another transcription factor would bind, which prevents the transcription of genes that are transcribed via the activity of that factor. While this does occur, the results are not consistent for all cell types and conditions; there is no generally accepted, general mechanism for transrepression. New mechanisms are being discovered where transcription is repressed, but the activated GR is not interacting with DNA, but rather with another transcription factor directly, thus interfering with it, or with other proteins that interfere with the function of other transcription factors. This latter mechanism appears to be the most likely way that activated GR interferes with NF-κB - namely by recruiting histone deacetylase, which deacetylate the DNA in the promoter region leading to closing of the chromatin structure where NF-κB needs to bind. 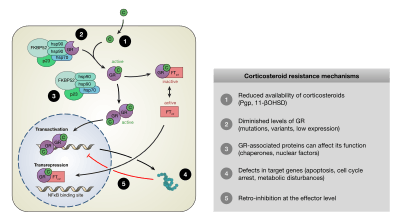 Activated GR has effects that have been experimentally shown to be independent of any effects on transcription and can only be due to direct binding of activated GR with other proteins or with mRNA. For example, Src kinase which binds to inactive GR, is released when a glucocorticoid binds to GR, and phosphorylates a protein that in turn displaces an adaptor protein from a receptor important in inflammation, epidermal growth factor (EGF), reducing its activity, which in turn results in reduced creation of arachidonic acid - a key proinflammatory molecule. This is one mechanism by which glucocorticoids have an anti-inflammatory effect. A variety of synthetic glucocorticoids, some far more potent than cortisol, have been created for therapeutic use. They differ in both pharmacokinetics (absorption factor, half-life, volume of distribution, clearance) and pharmacodynamics (for example the capacity of mineralocorticoid activity: retention of sodium (Na+) and water; renal physiology). Because they permeate the intestines easily, they are administered primarily per os (by mouth), but also by other methods, such as topically on skin. More than 90% of them bind different plasma proteins, though with a different binding specificity. Endogenous glucocorticoids and some synthetic corticoids have high affinity to the protein transcortin (also called corticosteroid-binding globulin), whereas all of them bind albumin. In the liver, they quickly metabolize by conjugation with a sulfate or glucuronic acid, and are secreted in the urine. Glucocorticoid potency, duration of effect, and the overlapping mineralocorticoid potency vary. Cortisol (hydrocortisone) is the standard of comparison for glucocorticoid potency. Hydrocortisone is the name used for pharmaceutical preparations of cortisol. The data below refer to oral dosing, except where mentioned. Oral potency may be less than parenteral potency because significant amounts (up to 50% in some cases) may not be absorbed from the intestine. Fludrocortisone, DOCA (Deoxycorticosterone acetate), and aldosterone are, by definition, not considered glucocorticoids, although they may have minor glucocorticoid potency, and are included in this table to provide perspective on mineralocorticoid potency. Glucocorticoids may be used in low doses in adrenal insufficiency. In much higher doses, oral or inhaled glucocorticoids are used to suppress various allergic, inflammatory, and autoimmune disorders. Inhaled glucocorticoids are the second-line treatment for asthma. They are also administered as post-transplantory immunosuppressants to prevent the acute transplant rejection and the graft-versus-host disease. Nevertheless, they do not prevent an infection and also inhibit later reparative processes. Newly emerging evidence showed that glucocorticoids could be used in the treatment of heart failure to increase the renal responsiveness to diuretics and natriuretic peptides. The major mechanism for this immunosuppression through inhibition of nuclear factor kappa-light-chain-enhancer of activated B cells(NF-κB). NF-κB is a critical transcription factor involved in the synthesis of many mediators (i.e., cytokines) and proteins (i.e., adhesion proteins) that promote the immune response. Inhibition of this transcription factor, therefore, blunts the capacity of the immune system to mount a response. In addition, glucocorticoids also suppress cyclooxygenase expression. Glucocorticoids could be used in the treatment of decompensated heart failure to potentiate renal responsiveness to diuretics, especially in heart failure patients with refractory diuretic resistance with large dose of loop diuretics. ↑ Pelt AC (2011). Glucocorticoids: effects, action mechanisms, and therapeutic uses. Hauppauge, N.Y.: Nova Science. ISBN 978-1617287589. 1 2 3 Rhen T, Cidlowski JA (Oct 2005). "Antiinflammatory action of glucocorticoids--new mechanisms for old drugs". The New England Journal of Medicine. 353 (16): 1711–23. doi:10.1056/NEJMra050541. PMID 16236742. 1 2 Pazirandeh A, Xue Y, Prestegaard T, Jondal M, Okret S (May 2002). "Effects of altered glucocorticoid sensitivity in the T cell lineage on thymocyte and T cell homeostasis". FASEB Journal. 16 (7): 727–9. doi:10.1096/fj.01-0891fje. PMID 11923224. ↑ Lupien SJ, McEwen BS, Gunnar MR, Heim C (Jun 2009). "Effects of stress throughout the lifespan on the brain, behaviour and cognition". Nature Reviews. Neuroscience. 10 (6): 434–45. doi:10.1038/nrn2639. PMID 19401723. ↑ Cahill L, McGaugh JL (Jul 1998). 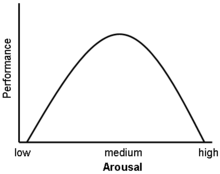 "Mechanisms of emotional arousal and lasting declarative memory". Trends in Neurosciences. 21 (7): 294–9. doi:10.1016/s0166-2236(97)01214-9. PMID 9683321. ↑ Carlson NR (2010). Physiology of Behavior (11th ed.). New York: Allyn & Bacon. p. 605. ISBN 978-0-205-23939-9. ↑ Belanoff JK, Gross K, Yager A, Schatzberg AF (2001). "Corticosteroids and cognition". Journal of Psychiatric Research. 35 (3): 127–45. doi:10.1016/S0022-3956(01)00018-8. PMID 11461709. ↑ Sapolsky RM (October 1994). 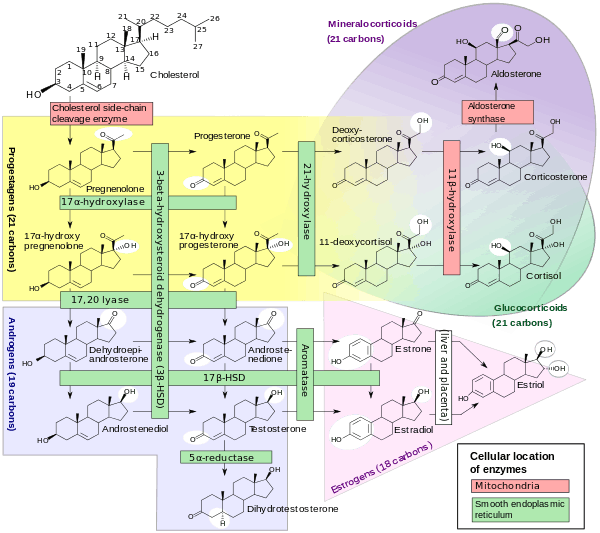 "Glucocorticoids, stress and exacerbation of excitotoxic neuron death". Seminars in Neuroscience. 6 (5): 323–331. doi:10.1006/smns.1994.1041. ↑ Lupien SJ, Maheu F, Tu M, Fiocco A, Schramek TE (Dec 2007). "The effects of stress and stress hormones on human cognition: Implications for the field of brain and cognition". Brain and Cognition. 65 (3): 209–37. doi:10.1016/j.bandc.2007.02.007. PMID 17466428. ↑ de Quervain DJ, Roozendaal B, McGaugh JL (Aug 1998). "Stress and glucocorticoids impair retrieval of long-term spatial memory". Nature. 394 (6695): 787–90. doi:10.1038/29542. PMID 9723618. ↑ Wolkowitz OM, Lupien SJ, Bigler ED (Jun 2007). "The "steroid dementia syndrome": a possible model of human glucocorticoid neurotoxicity". Neurocase. 13 (3): 189–200. doi:10.1080/13554790701475468. PMID 17786779. ↑ Norra C, Arndt M, Kunert HJ (Jan 2006). "Steroid dementia: an overlooked diagnosis?". Neurology. 66 (1): 155; author reply 155. doi:10.1212/01.wnl.0000203713.04232.82. PMID 16401879. ↑ Varney NR, Alexander B, MacIndoe JH (Mar 1984). "Reversible steroid dementia in patients without steroid psychosis". The American Journal of Psychiatry. 141 (3): 369–72. doi:10.1176/ajp.141.3.369. PMID 6703100. ↑ Liu C, Guan J, Kang Y, Xiu H, Chen Y, Deng B, Liu K (2010). "Inhibition of dehydration-induced water intake by glucocorticoids is associated with activation of hypothalamic natriuretic peptide receptor-A in rat". PloS One. 5 (12): e15607. doi:10.1371/journal.pone.0015607. PMC 3004933 . PMID 21187974. ↑ Liu C, Chen Y, Kang Y, Ni Z, Xiu H, Guan J, Liu K (Oct 2011). "Glucocorticoids improve renal responsiveness to atrial natriuretic peptide by up-regulating natriuretic peptide receptor-A expression in the renal inner medullary collecting duct in decompensated heart failure". The Journal of Pharmacology and Experimental Therapeutics. 339 (1): 203–9. doi:10.1124/jpet.111.184796. PMID 21737535. ↑ Hill MN, Carrier EJ, Ho WS, Shi L, Patel S, Gorzalka BB, Hillard CJ (2008). "Prolonged glucocorticoid treatment decreases cannabinoid CB1 receptor density in the hippocampus". Hippocampus. 18 (2): 221–6. doi:10.1002/hipo.20386. PMID 18058925. 1 2 3 4 5 Revollo JR, Cidlowski JA (Oct 2009). "Mechanisms generating diversity in glucocorticoid receptor signaling". Annals of the New York Academy of Sciences. 1179: 167–78. doi:10.1111/j.1749-6632.2009.04986.x. PMID 19906239. 1 2 3 4 5 6 Newton R, Holden NS (Oct 2007). "Separating transrepression and transactivation: a distressing divorce for the glucocorticoid receptor?". Molecular Pharmacology. 72 (4): 799–809. doi:10.1124/mol.107.038794. PMID 17622575. ↑ Leung DY, Hanifin JM, Charlesworth EN, Li JT, Bernstein IL, Berger WE, Blessing-Moore J, Fineman S, Lee FE, Nicklas RA, Spector SL (Sep 1997). "Disease management of atopic dermatitis: a practice parameter. Joint Task Force on Practice Parameters, representing the American Academy of Allergy, Asthma and Immunology, the American College of Allergy, Asthma and Immunology, and the Joint Council of Allergy, Asthma and Immunology. Work Group on Atopic Dermatitis" (PDF). Annals of Allergy, Asthma & Immunology. 79 (3): 197–211. doi:10.1016/S1081-1206(10)63003-7. PMID 9305225. 1 2 Leung DY, Bloom JW (Jan 2003). "Update on glucocorticoid action and resistance". The Journal of Allergy and Clinical Immunology. 111 (1): 3–22; quiz 23. doi:10.1067/mai.2003.97. PMID 12532089. ↑ Banuelos J, Shin S, Cao Y, Bochner BS, Morales-Nebreda L, Budinger GR, Zhou L, Li S, Xin J, Lingen MW, Dong C, Schleimer RP, Lu NZ (Jan 2016). "BCL-2 protects human and mouse Th17 cells from glucocorticoid-induced apoptosis". Allergy. 71: 640–50. doi:10.1111/all.12840. PMID 26752231. ↑ Pan LY, Mendel DB, Zurlo J, Guyre PM (1990). "Regulation of the steady state level of Fc gamma RI mRNA by IFN-gamma and dexamethasone in human monocytes, neutrophils, and U-937 cells". Journal of Immunology (Baltimore, Md. : 1950). 145 (1): 267–75. PMID 2141616. ↑ Ruiz P, Gomez F, King M, Lopez R, Darby C, Schreiber AD (1991). "In vivo glucocorticoid modulation of guinea pig splenic macrophage Fc gamma receptors". The Journal of Clinical Investigation. 88 (1): 149–57. doi:10.1172/JCI115271. PMC 296015 . PMID 1829095. ↑ Werb Z (1980). "Hormone receptors and normal regulation of macrophage physiological function". In van Furth R. Mononuclear phagocytes functional aspects. The Hague: M. Nijhoff. p. 825. ISBN 978-94-009-8793-7. Glucocorticoids may also decrease the number of Fc receptors on macrophages, but this immunosuppressive function is controversial because of the lack of sensitivity in Fc receptor techniques and the high concentration of glucocorticoids used in previous experiments. ↑ Goppelt-Struebe M, Wolter D, Resch K (Dec 1989). "Glucocorticoids inhibit prostaglandin synthesis not only at the level of phospholipase A2 but also at the level of cyclo-oxygenase/PGE isomerase". British Journal of Pharmacology. 98 (4): 1287–95. doi:10.1111/j.1476-5381.1989.tb12676.x. PMC 1854794 . PMID 2514948. ↑ Flower R, Rang HP, Dale MM, Ritter JM (2007). Rang & Dale's pharmacology. Edinburgh: Churchill Livingstone. ISBN 0-443-06911-5. ↑ Rado JP, Blumenfeld G, Hammer S (Nov 1959). "The effect of prednisone and 6-methylprednisolone on mercurial diuresis in patients with refractory cardiac edema". The American Journal of the Medical Sciences. 238: 542–51. PMID 14435747. ↑ Riemer AD (Apr 1958). "Application of the newer corticosteroids to augment diuresis in congestive heart failure". The American Journal of Cardiology. 1 (4): 488–96. doi:10.1016/0002-9149(58)90120-6. PMID 13520608. ↑ Newman DA (Feb 1959). "Reversal of intractable cardiac edema with prednisone". New York State Journal of Medicine. 59 (4): 625–33. PMID 13632954. ↑ Zhang H, Liu C, Ji Z, Liu G, Zhao Q, Ao YG, Wang L, Deng B, Zhen Y, Tian L, Ji L, Liu K (Sep 2008). "Prednisone adding to usual care treatment for refractory decompensated congestive heart failure". International Heart Journal. 49 (5): 587–95. doi:10.1536/ihj.49.587. PMID 18971570. ↑ Liu C, Liu G, Zhou C, Ji Z, Zhen Y, Liu K (Sep 2007). "Potent diuretic effects of prednisone in heart failure patients with refractory diuretic resistance". The Canadian Journal of Cardiology. 23 (11): 865–8. doi:10.1016/s0828-282x(07)70840-1. PMC 2651362 . PMID 17876376. ↑ Liu C, Chen H, Zhou C, Ji Z, Liu G, Gao Y, Tian L, Yao L, Zheng Y, Zhao Q, Liu K (Oct 2006). "Potent potentiating diuretic effects of prednisone in congestive heart failure". Journal of Cardiovascular Pharmacology. 48 (4): 173–6. doi:10.1097/01.fjc.0000245242.57088.5b. PMID 17086096. ↑ Massari F, Mastropasqua F, Iacoviello M, Nuzzolese V, Torres D, Parrinello G (Mar 2012). "The glucocorticoid in acute decompensated heart failure: Dr Jekyll or Mr Hyde?". The American Journal of Emergency Medicine. 30 (3): 517.e5–10. doi:10.1016/j.ajem.2011.01.023. PMID 21406321. ↑ Gennari C (May 1993). "Differential effect of glucocorticoids on calcium absorption and bone mass". British Journal of Rheumatology. 32 Suppl 2: 11–4. doi:10.1093/rheumatology/32.suppl_2.11. PMID 8495275. ↑ Keenan PA, Jacobson MW, Soleymani RM, Mayes MD, Stress ME, Yaldoo DT (Dec 1996). "The effect on memory of chronic prednisone treatment in patients with systemic disease". Neurology. 47 (6): 1396–402. doi:10.1212/WNL.47.6.1396. PMID 8960717. ↑ Koch CA, Doppman JL, Patronas NJ, Nieman LK, Chrousos GP (Apr 2000). "Do glucocorticoids cause spinal epidural lipomatosis? When endocrinology and spinal surgery meet". Trends in Endocrinology and Metabolism. 11 (3): 86–90. doi:10.1016/S1043-2760(00)00236-8. PMID 10707048. 1 2 Klein NC, Go CH, Cunha BA (Jun 2001). "Infections associated with steroid use". Infectious Disease Clinics of North America. 15 (2): 423–32, viii. doi:10.1016/s0891-5520(05)70154-9. PMID 11447704.